With more rug pads being made overseas and harmful to many floors, Rug Pad Corner maintains rug pad production in the United States to assure safety to all floors. Our Superior felt rug pad has been rated as 5 stars among thousands of customers! Rug Pad Corner, the nation's source for quality rug pads, is proud to announce that its entire line of rug pads is safe for all floor types. Unlike many other rug pads, those at Rug Pad Corner do not contain the chemicals, glues or adhesives that have been known to damage hardwood and many types of floors. Rug Pad Corner manufactures its rug pads and with recent changes in the industry to import more rug pads that contain inferior quality materials, the company is placing more importance than ever on its rug pads made in the USA. "We have always made our rug pads in the USA and will continue to do so while others are exploring outside countries", states Sam of Rug Pad Corner. "We know what goes into our rug pads and we want to keep it that way." Sam continues to state that more rug pads are made in places like China based on cost factors, yet the quality of those rug pads is inferior to the American made rug pads of Rug Pad Corner. Rug Pad Corner constantly receives telephone calls from customers asking if the rug pads are safe for their floor. This is based on bad experiences with other rug pads that had to be scraped off the floor. The felt and rubber rug pads at Rug Pad Corner are manufactured under strict quality measures and are guaranteed not to stick to any type of hard floor. "Rug pads from overseas can be made of plastic or nylon and then sprayed with a chemical adhesive", states Sam. "This almost always is a cause of adhesive odors and damage to most floors and we refuse to offer such rug pads." The rug pads manufactured by Rug Pad Corner are recycled felt, a recycled felt and rubber combination or all rubber. All of these materials and qualities have been tested, proven and rated as safe for all hardwood, wood, laminate, tile and all hard floor surfaces. Since Rug Pad Corner manufactures in the USA, the company strives towards strict quality control and constantly monitors its mills to assure only natural materials are used in the production of all of its rug pads. 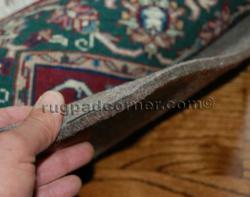 Visit Rug Pad Corner for more on rug pads safe for all floors.